The Chattahoochee River originates in the southeast corner of Union County, Georgia, in the southern Appalachian Mountains and flows southwesterly through the Atlanta metropolitan area before terminating in Lake Seminole, at the Georgia-Florida border. The river runs for a total distance of about 434 miles. The river joins with the Flint River as the two flow across the Georgia-Florida border, and the name changes to the Apalachicola River, which flows on to the Gulf of Mexico. The entire basin is often referred to as the Apalachicola-Chattahoochee-Flint (ACT) basin. The Chattahoochee River drains an area of 8,770 square miles and is one of the most heavily used surface water resources in Georgia. Over most of its length, the flow of the Chattahoochee River is regulated and controlled by 13 dams responsible for generating hydropower and electricity, in addition to three lock-and-dam facilities. The Chattahoochee River Basin is inhabited by about 24 species of freshwater aquatic turtles, about 37 species of salamanders and sirens, about 30 species of frogs and toads, and the American alligator. The Chattahoochee River Basin is home to 9 state threatened or endangered plant species. The Chattahoochee River is the second southern-most trout habitat in the United States (other: Guadalupe River, Texas) and is also one of only two trout streams in North America that flow through a major urban area (other: Bow River, Canada). The Chattahoochee River supplies 70 percent of metro Atlanta’s drinking water, which is more than 300 million gallons per day! 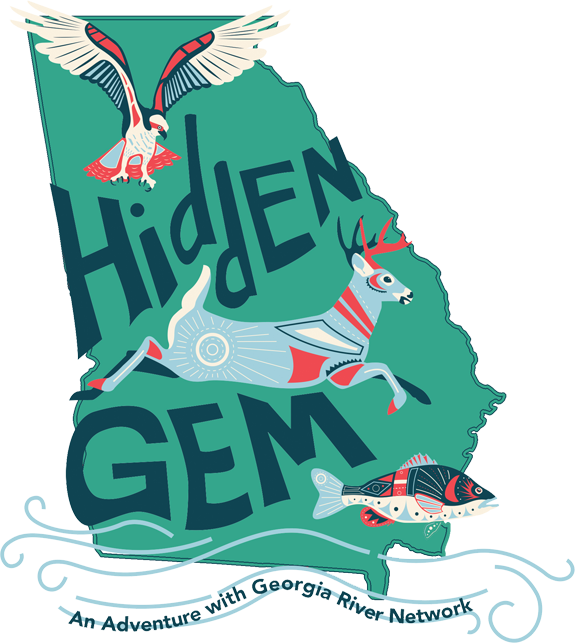 The headwaters above Atlanta comprise the smallest watershed providing a major portion of water supply for any metropolitan area in the country. According to 2008 data, the Chattahoochee River Basin gained 20.6 million gallons per day (mgd) through interbasin transfers and lost 67.3 mgd through interbasin transfers. As of 2008, there are approximately 169 facilities, including industries and municipalities, authorized to discharge wastewater into the Chattahoochee River Basin pursuant to NPDES permits. Polluted stormwater is the primary cause of water quality problems in the Chattahoochee River Basin, which contains roughly 500 industrial sites that are not complying with clean water laws. Timber is the leading cash crop in the basin. Total farmland in the basin has decreased since the 1970s, but poultry production has increased. Crops with the largest harvested acreage include peanuts, corn, soybeans and cotton. As of 2013, the EPD had issued 573 agricultural water withdrawal permits in the Chattahoochee River Basin. Power generation is the single largest water use in the basin. Sixteen of the Chattahoochee River Basin’s 22 power-generating plants are located along the main stem of the Chattahoochee River. Plants Wansley, McDonough-Atkinson, and Yates are operated by Georgia Power Company. Plant Farley is operated by Southern Nuclear. Plant Franklin is operated by Southern Power Company. Apalachicola Bay produces 90 percent of Florida’s and 10 percent of the nation’s oyster harvest, and functions as a nursery for shrimp, blue crabs and a variety of fin fish. Thirteen dams are located on the Chattahoochee River. The U.S. Army Corps of Engineers operates five large reservoirs along the Chattahoochee River: Buford Dam (Lake Lanier); West Point Dam; Walter F. George Lock and Dam; George W. Andrews Lock and Dam; and Jim Woodruff Lock and Dam (Lake Seminole). Georgia Power Company operates a series of hydroelectric dams along the middle portion of the river between West Point Lake and and Lake Water F. George. Morgan Falls Dam, which forms Bull Sluice Lake, was built by the Georgia Railway and Power Company in 1902 to provide electric power for the Atlanta trolley system. Chattahoochee Nature Center is a private, non-profit educational facility located in Roswell that teaches about the wildlife and ecosystems of the Chattahoochee River. For more information, visit https://chattnaturecenter.org/. Chattahoochee River National Recreation Area includes 48 miles of river and 16 parks to preserve the beauty and recreational value of the river. For more information, visit https://www.nps.gov/chat/index.htm. Lake Lanier encompasses 38,000 surface acres of water with 540 miles of shoreline. There are many recreational areas with boat ramps and camping facilities. Marinas dot the shoreline and sailing, kayaking and boating clubs provide training and social activities. The Elachee Nature Science Center and the Lanier Museum of Natural History offer educational opportunities. For more information, visit https://lakelanier.com/welcome/. West Point Lake offers campgrounds, day use facilities and two marinas. Chattahoochee Bend State Park is one of Georgia’s largest state parks, protecting five miles of river frontage. It offers a boat ramp, campsites, and more than six miles of wooded hiking trails. Chattahoochee River Paddle Trail: a canoe and kayak trail running 36.2 miles from the river’s confluence with Sautee Creek below the town of Helen to Clarks Bridge on Lake Lanier. Limited camping is allowed on some DNR property by making reservations through Wildwood Outfitters. Water Trail: The Chattahoochee River Water Trail offers 48 miles of river trail within the Chattahoochee River National Recreation Area and is available for raft, canoe, kayak, and motorboat use year round. For more information, visit https://www.garivers.org/crnwt.html. Burnt Fork Watershed Alliance, Inc.
305(b)/303(d) Listings – In the Chattahoochee River Basin, there are approximately 183 rivers and streams listed on the 2012 integrated 305(b)/303(d) list as waters not supporting their designated uses. These impaired waters include roughly 1,000 miles of the Chattahoochee River Basin’s waterways. In 2000, the city of Atlanta was forced by a federal consent order to remove 568 tons of trash, including seven automobiles, from streams that feed into the Chattahoochee. As metropolitan Atlanta has experienced unprecedented growth during the last 30-plus years, severe sewage discharge problems and sediment inflow have affected water quality. In 1998, Mayor Campbell signed a Federal Consent Decree committing the City of Atlanta to an accelerated program of activities designed to further improve water quality in metro Atlanta streams in addition to the Chattahoochee and South Rivers. In 1999, the Consent Decree was amended to added projects that would eliminate water quality violations from sanitary sewer overflows. The fall line designates a dramatic change in character for the Chattahoochee, as it stops flowing from the mountains and starts running to the sea. Dropping more than 300 feet over 38 miles, the river historically raced over a long series of waterfalls and shoals created by the transition from Piedmont to Coastal Plain. The fall line provided the perfect setting for textile mills and factories, as well as marked the end of navigable waters from the Gulf of Mexico. Millions of years before, the fall line had marked the edge of that same ocean body. The lower Chattahoochee probably has the largest collection of archaeological sites in Georgia, ranging from Paleo-Indian to Creek. During the Mississippian Period (A.D. 800-1600), at least sixteen significant settlements dotted the Chattahoochee’s banks south of the fall line. Over the centuries, the river served as possibly the most important route for connecting the Gulf of Mexico to the interior of the nation. It allowed for Indian tribes to travel and trade, and it provided entry for white explorers and settlers. The Spanish traveled up the river as early as 1639 and tried to establish exclusive trade with the Creeks. During the 1830s, Columbus erected a dam to divert water to its business district, enabling it to become one of the South’s most prominent industrial centers by the 1850s. In 2012, the dams were removed and the river was sculpted into an urban whitewater park.